Our 3D/4D and HD Live ultrasound imaging services gives you a realistic view of your baby. 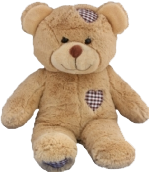 At Peek a Boo 4D Baby we can record your little ones heartbeat in one of our adorable stuffed animals. These are great keepsakes or gifts for a deployed daddy or grandparents out of town. BabyFlix app of entire session set to lullaby music, can send to anyone in the world! Great for military, grandparents, etc.